shibaa987 2 years, 8 months ago. Ark Benefit A3 CM13 (CyanogenMod 13) (Codename: peach) Marshmallow Custom ROM is an UNOFFICIAL Android Marshmallow build for Ark Benefit A3. In addition to this, we also have the Lineage OS 14.1 for Benefit A3. This Ark Benefit A3 CM13 (CyanogenMod 13) ROM is brought to you by developer lolmaxlik. Current status of this ROM is UNKNOWN. It is strongly recommended that you take either a NANDROID backup or take a complete sync of your phone data. For more CM13 ROM updates and OFFICIAL update for Ark Benefit 3 CM13, you can have a look on the big CM13 devices list. Installing custom ROM requires a custom recovery to be installed on your device, which in-turn may require the bootloader to be unlocked which may VOID your warranty and may delete all your data. Before proceeding further you may consider backup your all data. You are the only person making changes on your phone and neither we nor the developer can be held responsible for the mistakes done by YOU. TWRP recovery for the Ark Benefit A3 (Codename: peach). The TWRP is for Elephone trunk and should be compatible Benefit A3. Make sure that you have a custom recovery installed on your Ark Benefit A3. If not then download the recovery from above downloads section and you can follow this How to Install recovery on a mediatek device guide. Download and Copy the GApps and Ark Benefit A3 CyanogenMod 13 ROM ZIP to your phone. – Use the same guide to flash the GApps too. 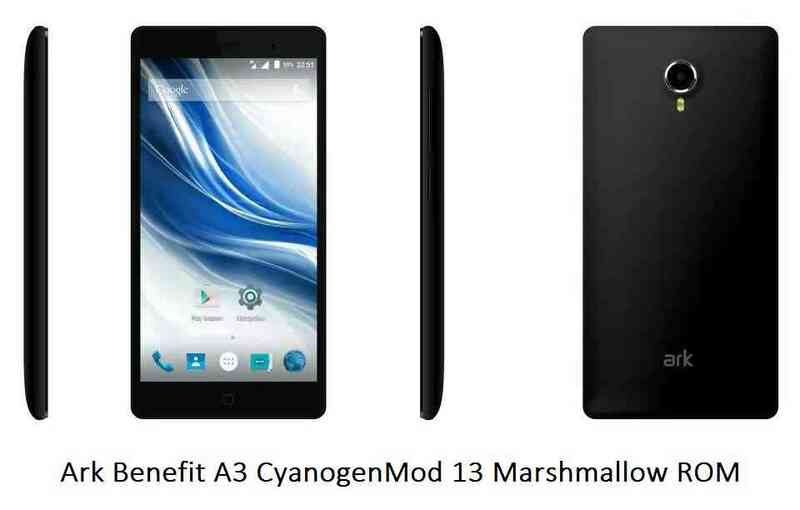 Reboot and Enjoy the CyanogenMod 13 Marshmallow ROM on your Ark Benefit A3. Copy the latest Ark Benefit A3 CyanogenMod 13 ROM ZIP file to your phone. Stay tuned or Subscribe to the Ark Benefit A3 forum For upcoming Android Nougat ROMs, CyanogenMod Custom ROMs, other ROMs and all other device specific topics.